Treatment: Symptomatic treatment, Traditional Chinese Medicine and rehabilitation therapy. Diana was appeared with intense and persistent shoulder & back pain 27 days ago, her pain was alleviated after transfusion. However, Her sensation was decreased, numbness and four limbs weakness gradually aggravated, with dysuresia. After clinical examinations and primary treatment, her diagnosis still hadn’t confirmed yet. 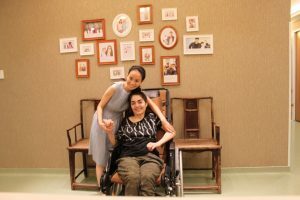 She received rehabilitation therapy without any specific diagnosis which caused her symptoms became worse. Later on, Diana turned to Beijing Puhua International Hospital for further treatment. After admission, she underwent thorough clinical investigation. With the investigation results, a multiple disciplinary consultation was held, and the diagnosis was confirmed as anterior spinal artery infarction. A comprehensive treatment plan was made for her according to the diagnosis. Soon after starting the treatment, Diana’s symptoms began improved. The patient’ muscle strength was decreased in four limbs, with muscular atrophy. Tendon reflex was absent in upper limbs. Needling sensation below T4. Her mental status, appetite and sleeping were poor, with constipation. Diana’s weight was decreased also. Excessive sweating and burning sensation. Diana’s mood was very low, her family was extremely worried as well. After admission, several medical protocols were applied, including anti-platelet aggregation, acid-suppression to protect gastric mucosa, as well as medical improvement of cerebral circulation, nutrition and metabolism, combined with traditional Chinese medicine (TCM), rehabilitation therapy, hyperbaric oxygen therapy. Soon, Diana’s symptoms showed improvement. After 23 days comprehensive treatment, her mental status, appetite and sleeping are all greatly improved. Muscle strength is significantly improved in four limbs: increased 2-3 grades. Her arms can leave bed and rotation, right hand is able to bend and touch her face. She is also able to shrug shoulder and bend down, she can sit alone for several minutes and walking with help. Excessive sweating is disappeared, burning sensation is reduced. Diana is very surprised about her improvement day after day. She becomes more happy and more positive to cooperate with the treatment, which is very helpful for her continuous improvement. Diana’s father is very thrilled to see her improvement and cannot help to shed tears of joy. He expressed her thanks to BPIH’s medical staff for their proper and professional treatment, and for the caring from nurses and customer service staff. 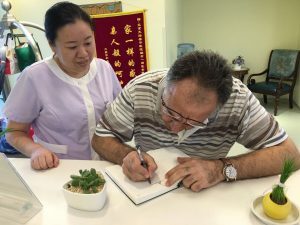 Diana gets to know a Chinese boy who is suffering form intracranial infection during hospitalization, she said goodbye to him before she left, and encourage and wish him a good recovery . BPIH’s medical staff has taken Diana as their friends and family, we are looking forward to seeing her continuous improvement soon.